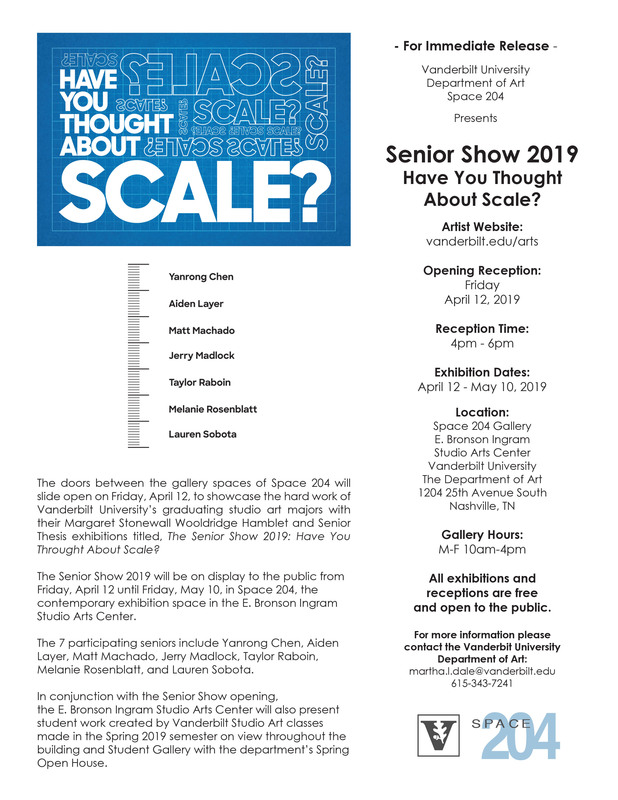 Senior Show 2019: Have You Thought About Scale? 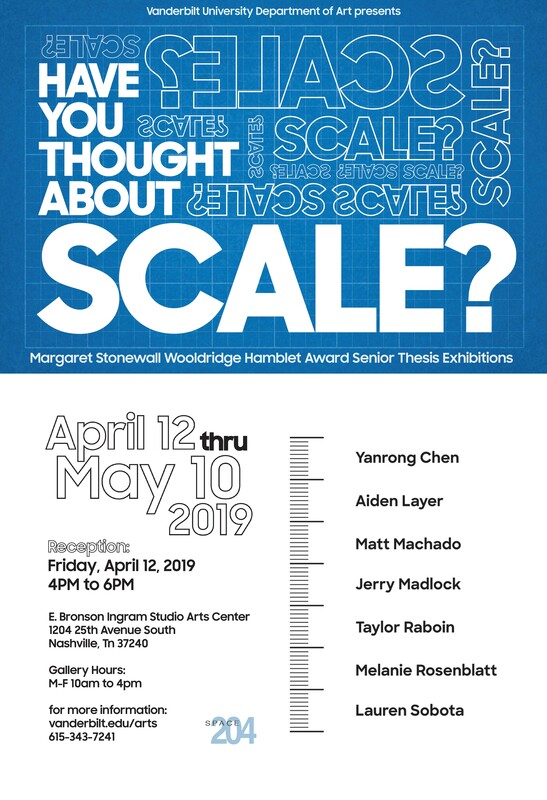 The doors between Space 204 and Gallery 2 will slide open on Friday, April 12, to showcase the hard work of Vanderbilt Universities graduating studio art majors with their Margaret Stonewall Wooldridge Hamblet and Senior Thesis Exhibitions collectively called, The Senior Show 2019: Have You Thought About Scale? An opening reception is scheduled for Friday, April 12, 2019 from 4pm to 6pm. The Senior Show 2019 will be on display to the public from Friday, April 12 through Friday, May 10, in Space 204, the contemporary exhibition space on the second floor of the E. Bronson Ingram Studio Arts Center (1204 25th Avenue South, Nashville, TN 37240). The 7 participating seniors include Yanrong Chen, Aiden Layer, Matt Machado, Jerry Madlock, Taylor Raboin, Melanie Rosenblatt, and Lauren Sobota. In conjunction with the Senior Show opening, the Department of Art will also host an open house featuring student work from the Spring 2019 semester studio arts classes on view throughout the building and Student Gallery. Regular Gallery hours are Monday thru Friday, 10am to 4pm. Space 204 acknowledges federal holidays with any closing/opening changes announced on the Department Facebook account, Vanderbilt Art. Stonewall Wooldridge Hamblet Award to an eligible senior major student. for one year, culminating in a one-person exhibition at Vanderbilt. There is an endearing story behind the gift that Mr. Clement H. Hamblet established in memory of his wife, Margaret Stonewall Wooldridge. The soon to be Mrs. Hamblet was taking a sabbatical year from her studies in studio art at Peabody College to study painting in Paris when the two met. It was a time both remembered fondly. Mr. Hamblet wanted to create a similar experience of travel and time to develop one’s art. The Margaret Stonewall Wooldridge Hamblet Award has changed the lives of many of the recipients as well as helped to build the studio art program at Vanderbilt. The gift allows a graduating senior, who is serious about pursuing art, to travel and have time to create. In 1984, this was a surprising gift to a department without an art major although many students did thoughtful and interesting work over the years. Receiving the Hamblet Award gave most of the students the confidence and the time to build a body of work, to pursue graduate degrees, or to develop their own art studios. In 2005, with new facilities, additional faculty and support from the administration, Vanderbilt began to offer a Bachelor of Arts degree in studio art. The Margaret Stonewall Wooldridge Hamblet Award became an important element in the development of our art major. The competition and the accompanying art exhibition have created a capstone experience for our seniors serving as a natural extension of a senior thesis. The gift also enriches the senior major experience throughout the entire senior year, with guest artist visits as well as an art-viewing trip to a city with a vibrant art community for all the majors. A year and a half after graduation, the winner of the Hamblet competition returns to campus to mount a solo exhibition of the work he or she has completed during the award year. Happily, in 2002, the department was able to add a merit award as well. The Department of Art is grateful to the Hamblet family for providing such a remarkable opportunity for our students.